May 7, 2012 By arzea 49 Comments This post may contain affiliate links. Read my disclosure policy. I am obsessed with Pinterest (if you aren’t on it, let me know and I will send you an invite! ), and you can find anything and everything on that website. I love it because I can put my ideas somewhere and be somewhat organized about it. I am also a very visual person, and for me when I see something I am more likely to be inspired to do it (rather than just reading about it). Insert refinished furniture here. 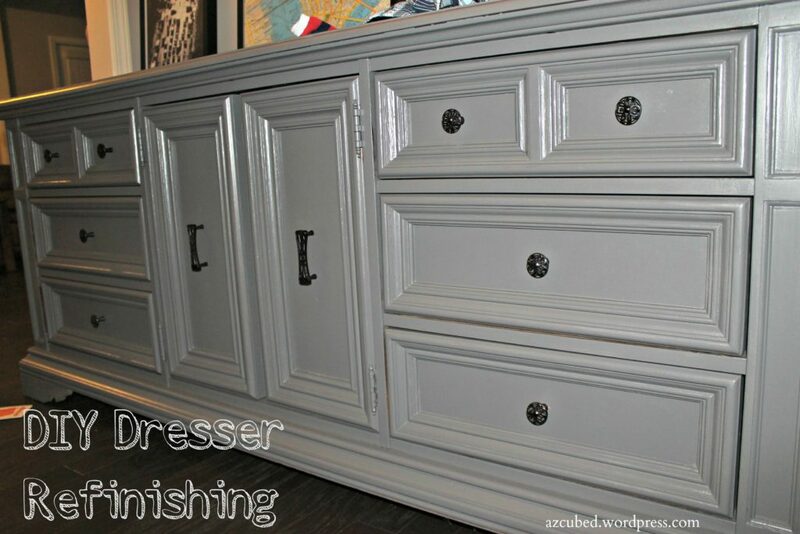 I always knew you could refinish furniture, but I never knew how to do it. Insert Pinterest here. 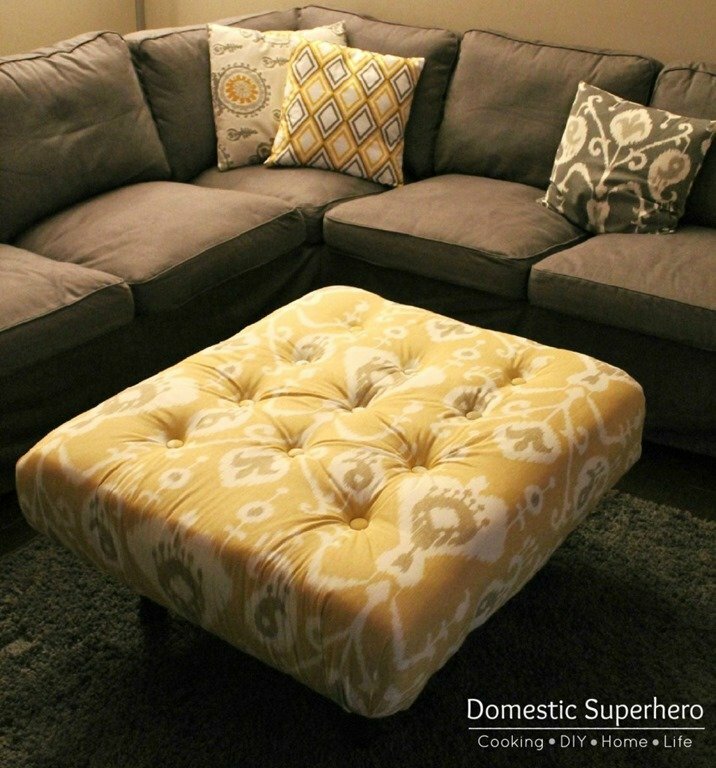 I found so many awesome furniture makeovers; Hideous side tables, 1960’s outdated night stands, beat up abused dining room tables…you name it, I found it. 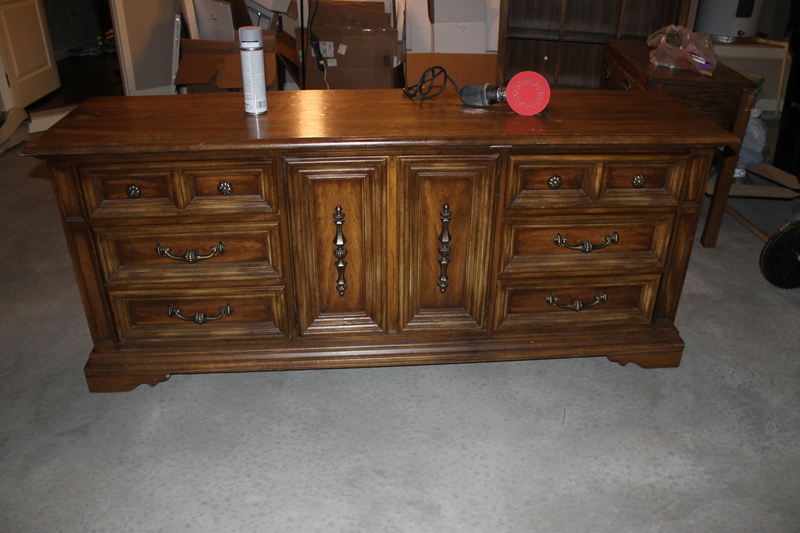 Since we moved into a new house, that needs some furniture, I thought it would be a great idea to find some quality pieces that just needed a little TLC and refinish them. But what to do?!?! 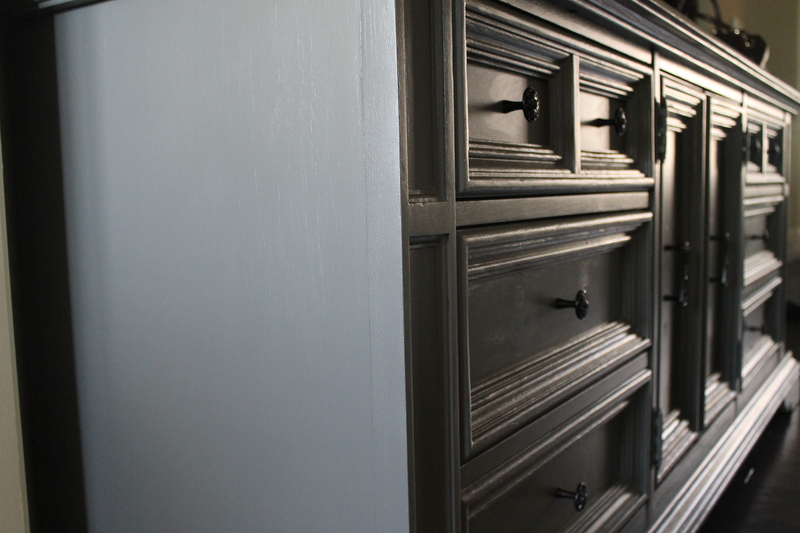 Paint colors, glazing options, new hardware?!?! There were so many options. First I started lurking on craigslist like a crazy person. I was looking and looking for the perfect item to make over…and finally, after a few weeks I found it! It was for sale at a church sale and marked down from $90 to $60. It is huge, but I could envision it perfectly in our entry way. So this is the glorious dresser! Inside those middle cabinets are 3 pull out drawers, so it has a lot of storage. There were a lot of dings, scratches, and little chunks of wood missing, so I had a big sanding job in store. I borrowed my boss’s orbital sander and bought some different types of sandpaper. 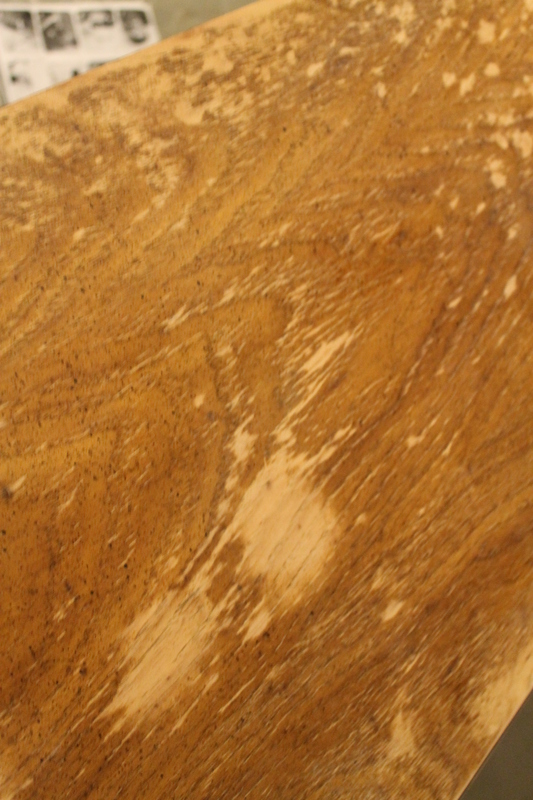 I used 120 grit for most all of it, and then a little finer towards the end. I took off all the hardware, and filled those holes with wood filler and then sanded that as well. I found it really difficult to get the holes to completely go away, so a couple of the drawers have tiny indentations, but I am going to tell myself that I am the only one that will really notice them. After sanding and sanding and sanding for what seemed like forever, and coated everything in our garage with an inch of dust (no joke), I felt like it was sanded well enough. 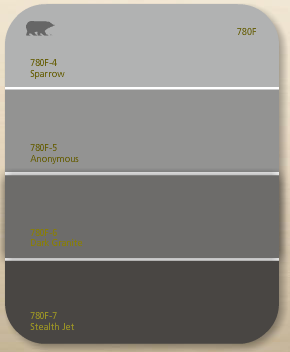 Next I had to decide on a paint color, how hard could it be? Well, with me being the most indecisive person alive when it comes to ‘big’ decisions like that, of course it was difficult. 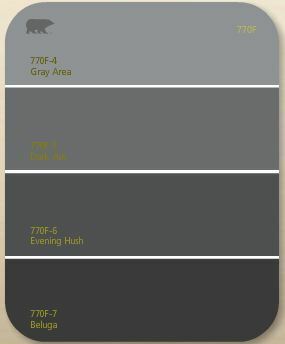 I took a million paint samples, even though I knew I wanted the paint in the grey family. But after telling the gentleman at Home Depot to whip it up, I started panicking that it was too dark, and I asked him to stop! I grabbed a couple more samples and then headed back home to think it over. I consulted my husband and he said that he liked ‘Annonymous’ (see below), but I thought it was too light. I ended up falling in love with the ‘Dark Granite’, and sent my husband back to HD to pick up a quart. Dark Granite was the winner! While learning about how to paint wood furniture, I learned that you must prime the piece, or it will end up in a disaster. I was planning to prime it separately, but then the guy at Home Depot told me that you can buy paint with primer in it!! So I added the primer to the paint and saved myself an extra step of painting. Onto the painting! I plugged my ipod into the garage, got my paint set up, and got to it! I put a second coat on the top because it was already dry by the time I did the rest, and I let it dry overnight (well, more like 2 days). I was actually dreading tackling the drawers because they have so much carving/detail on them that I thought they would be really difficult. They were, but it wasn’t too bad. I also felt like it would take a long time to do all 9 drawers. I decided that I wouldn’t paint the inside, and eventually just line the bottoms with pretty paper or fabric (that will be done in the future). 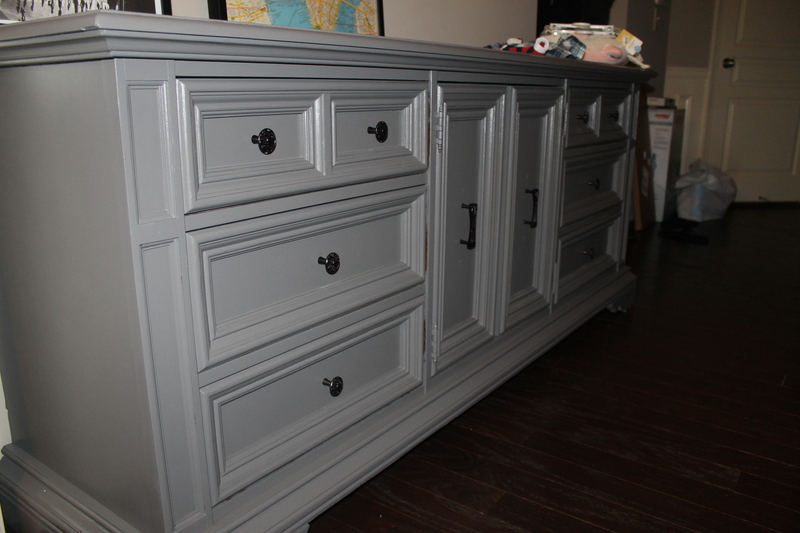 A few days later I did a 2nd coat on the entire dresser, and it looked great! There was still a tiny bit of wood coming through on the left and right sides of the dresser, so I did one more coat on those, and then another coat on the top. Lastly I did all the drawers, and those definitely took the longest. I ended up putting 2-3 coats on depending on how it was looking. I had a hard time with some of the spots with the wood filler (from the hardware holes), and ended up having to sand it down a lot more over those areas, and then repaint…it was a process. Next I was on the hunt for some new drawer pulls and handles. I was just browsing at Home Depot and came across these pulls that I really liked. They were only $2.99 per pull, which was inexpensive, but since I had to buy 8, I knew it would add up quick. The door handles were only $3.49 per piece (I got 2). Andres helped me measure the drawers so that I would get them exactly in the middle, and then we drilled the holes. A little while later we were able to screw in all the pulls and bring it inside! Well, that is it! Hopefully I will have the top adorned with cute decor soon enough! Stay tuned! Good job – that looks great! wow – this looks great. I’m feeling inspired to do something crafty. But then I think about how much time it takes and I’m not feeling as inspired. haha BUT – you made such an old, outdated piece look so modern and awesome! LOVE! Great job! 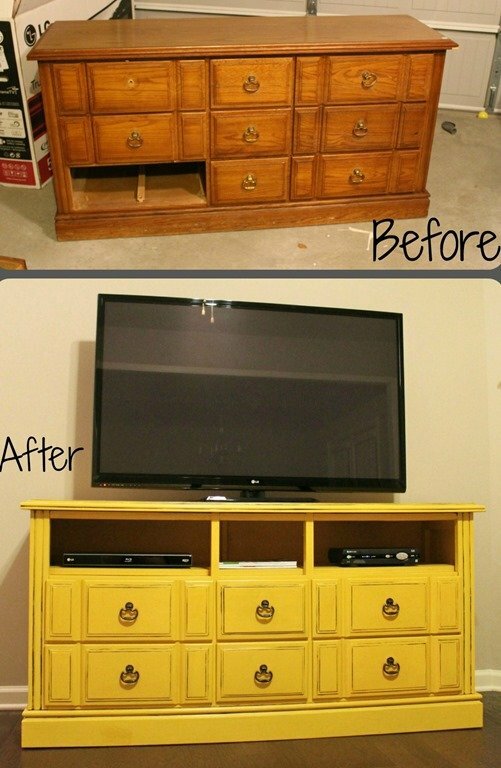 I tried tackling something like this once but the dresser still sits in my garage to this day. I got as far as sanding some of it down. 🙂 Love the gray color! It was definitely a lot of work. I wish I would have started with something with a little less carving etc….but, i am happy i did it. Thanks! 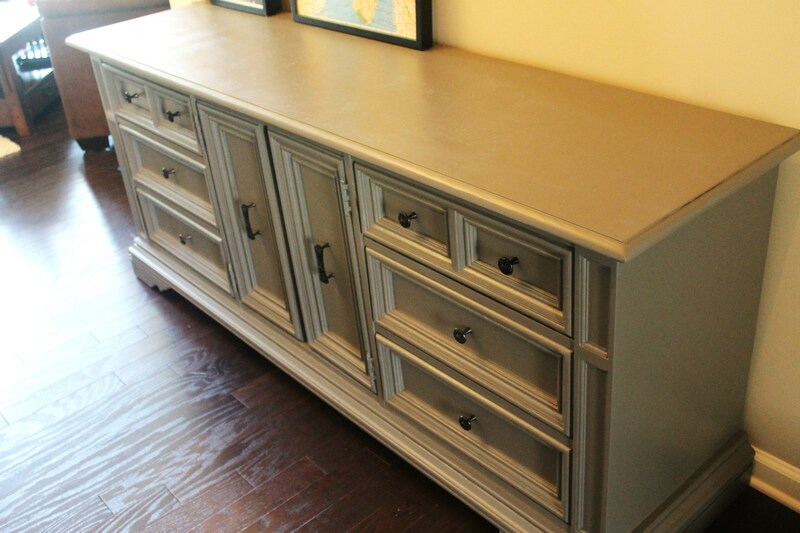 Love the color– The lines look so much cleaner and updated with the new knobs… Great job. Thanks for showing it. Thank you! 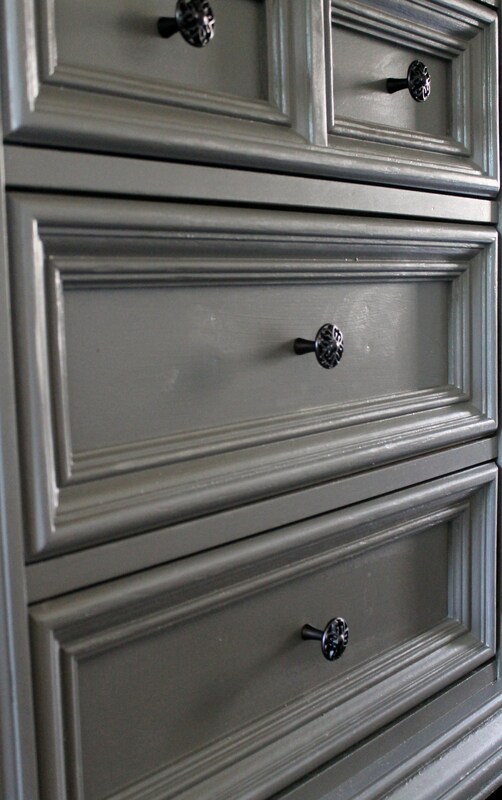 I love the knobs too! I felt like the old ones just could not be restored to match. What an amazing renovation! Looks great. Thank you! It was a lot of work but it was worth it! Thank you! It was quite a process, but it didn’t kill me 🙂 I just finished a hutch too, and it was totally worth it. Do it! Thank’s, I think I will before the summer ends! (I also want to paint a dark brown desk) ! Thank you so much for the sweet compliments!! 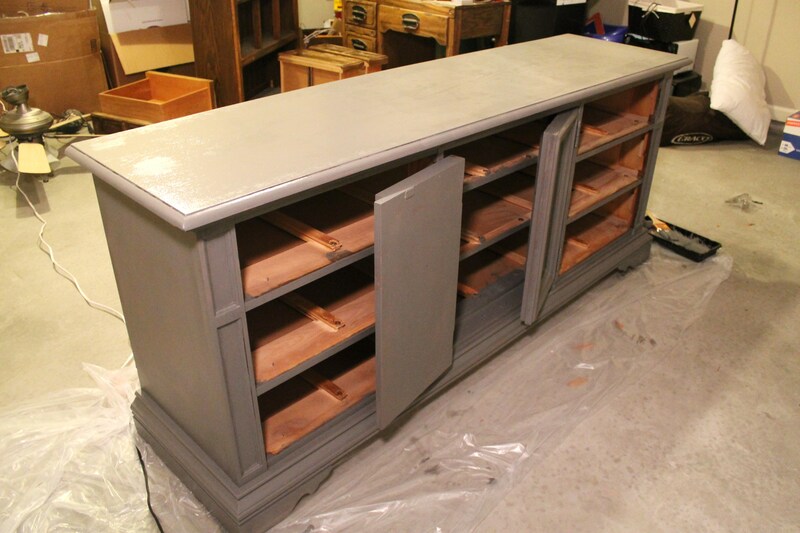 I am so happy you got to refinish your desk, I bet it looks great!! 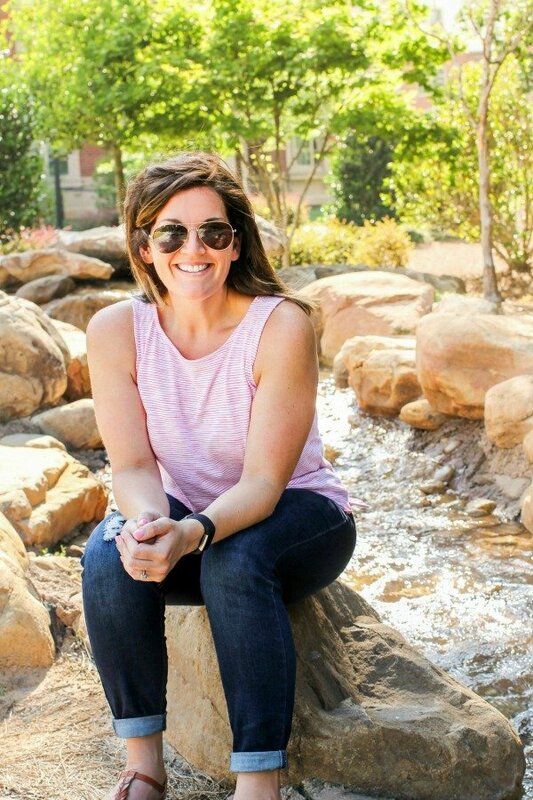 I can’t wait to see your post, and I would love for you to mention me in there! I am going to follow you so I don’t miss it!!! I clearly have my priorities straight! LOVE this! It turned out amazing, and the colour is perfect! The details may have been harder to paint but they’re what really make the piece something special 🙂 Just gorgeous! Thank you! She was a beast to paint for sure! 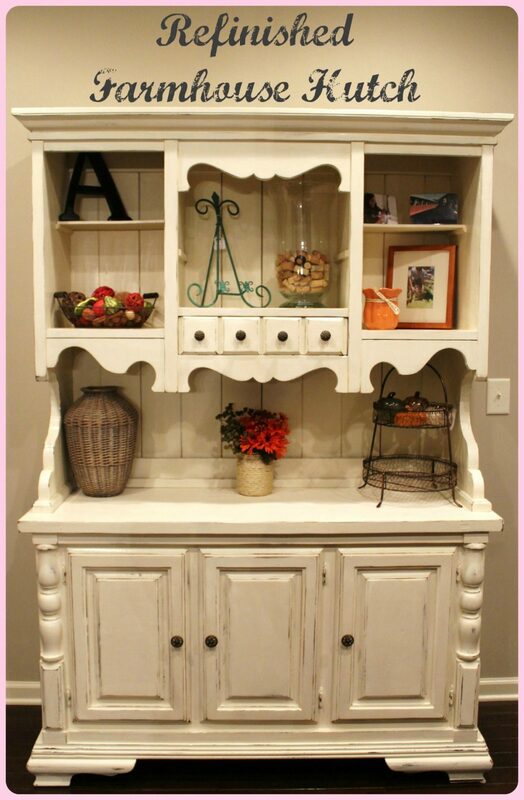 This dresser is absolutely stunning!! 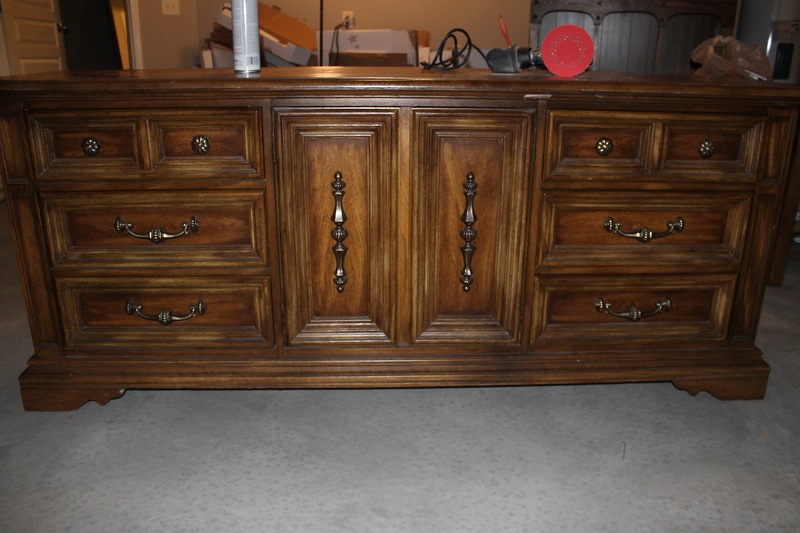 Great job refinishing!! Thank you, Chelsey!!! And Thanks for stopping by my blog! I’m very happy to discover this website. I want to to thank you for your time for this particularly wonderful read!! I definitely savored every part of it and i also have you book-marked to see new things in your blog. Wow, that color is fabulous! The whole thing looks great, good job! Thanks for sharing at The Fun In Functional! Thanks, Jessi, and thanks for hosting! Did you use a regular brush or did you also incorporate a mini paint roller? I am about to embark on a marathon refinishing session before a party I’m hosting in two days. Two chair frames, one credenza, and two small tables. Yikes! I used a regular brush. It’s hard for the paint to get really smooth with a roller, but if you try it let me know how it turns out! Please share pictures! I can’t wait to see! Love this! What sheen of paint did you use? 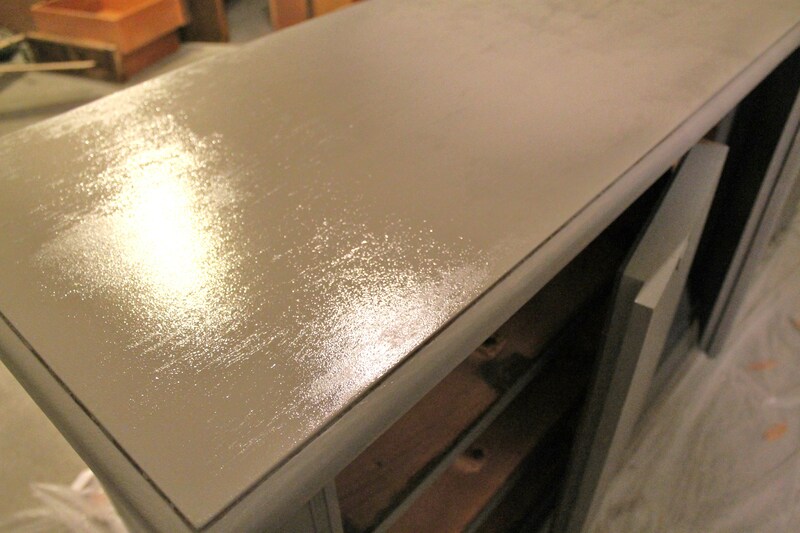 I am about to redo a dresser for our son on the way and I don’t know if I should do semi-gloss or glossy, or did you do something else? I actually used eggshell, as I was going for a more matte look. It looks pretty glossy in the pictures, but it’s actually pretty matte in person. Unless you want it really shiny, I would stick with eggshell or semi-gloss! Good luck! I’d love if you post pictures of your project when it’s done on my facebook page! did you use a roller or a brush to put the paint on??? A brush! There is no way I would have gotten into all those grooves with a roller. Plus, a brush gives you a much smoother finish. Hello there! I admire your projects. How do you paint the wood? What are your tricks? There are so many different ways to paint a dresser so what did you find worked for you? Brush? Roller? Sponge? Your pieces are clean with no brush strokes. Please advise! !! Did you use a roller for the paint and what did you use for the insode corners? Looks great i love it! Im almost ready to paint mine. Hey! I used a roller on the top and then a brush for the rest. Now when I paint furniture though, I find using a brush the whole time is much easier! Thank you for that information, i so appreciate it. Have a great day!